Even though we sometimes use words and sentences etc., many things are better expressed using pictures. Especially in technical discussions it's often useful to convey thoughts through various kinds of boxes and lines between them. For this, emacs has picture-mode. It's a bit hard to textually describe how to draw pictures in it, but a lot of it can be explained with the following little matrix (think of the directions on a compass). The key pressed determines your typing direction; ie. type C-c ' and the some '/'-characters will get you a line to the upper-right (north-east). This will be only available after you activate picture-mode, (M-x picture-mode). 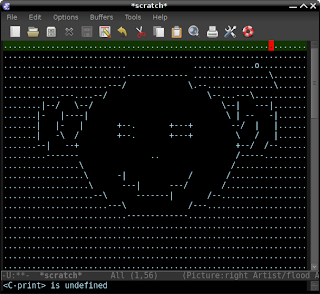 Now, because picture-mode is often used in combination with another (say, you want to draw a nice little ascii-art diagram in an e-mail), you can activate picture mode, do your drawing action, and then go back to the previous mode with C-c C-c. 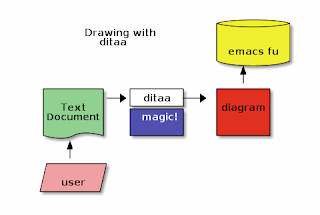 There are some more interesting commands; please see the emacs reference manual for details. There's another mode for emacs, called artist-mode, which is better suited when you want to express your emotions through art. It must be said, however, that it's often quicker to create some figures in artist-mode than in picture-mode; that's not really a problem, as you can switch between the two. There's a nice screen cast of someone using artist-mode to draw a linked-list in a code comment. My emacs gives the artist-mode menu with just plain middle-click - I think the shift might be redundant. don't know if this is the right post to comment on, but how when using this with org-mode, how do we get around the "C-c '"? These bindings de/activate the separate buffer for the chunk, and it is used for the NW direction. did u run into this? @vinhdizzo: you can of course change the keybinding, or edit in another buffer. but yeah, the C-c prefix is used in many places (esp. org-mode), conflicts are to be expected. Using artist-mode in org-mode with sections collapsed causes a problem. It looks like artist-mode is matching the line you click on to a relative line (presumably to the top on the screen) in the buffer. Which counts the hidden lines too. for using artist-mode in org-mode, just select some part, then use narrow-to-region, enable artist-mode, draw, then switch back to org-mode and use widen.